This week, pop starlet Miley Cyrus made a major announcement regarding her upcoming tour plans. The much talked about singer visited the stage of Saturday Night Live over the weekend to make an announcement regarding her new 2014 tour. The singer made the official announcement, revealing that the tour would be called the “Bangerz” tour, the same name as her latest album. While on tour, fans of the performer can expect to hear some of the biggest songs from this wildly popular new album. During the announcement, the singer did not provide any details on dates for the tour. Official dates and stops for the jaunt are expected to be released sometime within the next month. The massive tour event is expected to take the singer to various stops across North America. While many are excited about the long awaited Miley Cyrus concert, another big tour announcement was also revealed this week that has rock fans ready for the new tour season. The rock band Jimmy Eat World revealed that they will be doing eight performances in the United States following their upcoming European tour. The band is slated to be on tour until November 19th. Then they will travel to the United States for a string of shows that will begin on December 6th in Orlando, Florida. These shows will keep the band on the road until December 31st. On this new tour, the rockers will be promoting their eighth studio album “Damage” that was released earlier this year. Tickets for these new shows are on sale now and available to the public. Recently, the R&B and hip hop artist Common revealed new plans for a tour event he has coming up. The tour will kick off this week with a massive concert with Mastha Ambrosius on October 29th at the Best Buy Theatre at Times Square in New York City. From there the rapper will be heading out to several other stops, including concerts in both Baltimore and in Los Angeles, as well as stops in major markets like Boston. The jaunt will concluded with a February stop at the Bob Hope Theatre in Stockton, California. During this tour fans can expect to hear some of Common’s biggest songs from his long and successful career in the business. Tickets are now on sale and available to those who want to see Common take the stage live. This week, the official tour schedule for the highly anticipated Jingle Ball 2013 tour was released to the public. A few weeks ago, the artists that are slated to participate in the show were revealed. The tour is slated to feature artists like Selena Gomez, Fall Out Boy, Robin Thicke and One Republic with different artists performing at different nights. The tour will officially kick off on Monday December 2nd at the American Airlines Center in Dallas, Texas and will features Robin Thicke, Ariana Grande, Austin Mahone and Flo Rida. From there the tour will visit cities like Philadelphia, Everett, and Chicago. In Los Angeles, the stop will feature shows from Miley Cyrus, Macklemore & Ryan Lewis, Selena Gomez and Enrique Iglesias. “Night Vision.” The winners of the 2013 Billboard Breakthrough Band of the year will finish up a few shows through the end of 2013 and kick off their final leg starting on February 8th in Boise, ID. From there the group will visit 21 additional stops in the US and Canada before wrapping up their tour on May 15th in Denver. Tickets go on sale next month for these newly unveiled shows. The popular production known as Cirque Du Soleil or “the Circus of the Sun” is a unique live show that has been getting the attention of audiences from all over the globe since it first debuted. The show originally formed in Canada, when a group of performers came together to deliver a live entertainment spectacular that mixed both street entertainment and circus arts together. Beginning in the 1990s the show truly began to take off, and more variations of the show were added. Now there are more than 19 different Cirque Du Soleil shows, performing in more than 271 cities throughout the world. The show is currently hosting performances on every continent except Antarctica showing Cirque Du Soleil productions. The performance has even received a Hollywood Walk of Fame star thanks to its immense popularity within today’s entertainment business. However, for many the most popular show under the Cirque Du Soleil name is the permanent show held in LasVegas. These Vegas shows are highly responsible for helping the Cirque Du Soleil name become as popular as it is today. The Cirque Du Soleil Las Vegas venue alone is able to hold thousands of fans every evening. While Las Vegas originally had just one original Cirque Du Soleil show, since the production has been adding new variations to their shows, Vegas has become a hotbed for all types of these productions. While most cities only host one Cirque Du Soleil show at a time, Las Vegas currently holds multiple shows at once, all with their own unique story but all still honoring the original Cirque Du Soleil type of performance style. This week it was revealed that iconic country performers Emmylou Harris and Rodney Crowell will be joining forces and heading out together in a new upcoming tour event. The tour will be called “Old Yellow Moon” and will support their latest collaboration of the same name. The tour begins on Saturday October 10th in Lewisburg, PA and visits 10 different North American major markets throughout the year. Beginning on February 1st, 2014 the tour will pick up again in Wilmington, NC, with more dates to follow. Tickets are on sale now for those who want to see the Billboard chart topping folk artists perform live. However, one of the biggest announcements of the week came from the wildly popular boy band The Wanted. The UK based band has just announced that they will be heading out for their first major world tour event. This new tour will be kicking off next year and will be supporting their upcoming release called “Word of Mouth.” During this tour event, fans of the pop artists can expect to hearsome of the new tracks that will be featured on this release as well as some of the major hits that first helped the five piece group rise to the top of the charts. This week, legendary guitarist and multi-Grammy award winning performer Carlos Santana made a major announcement about his upcoming performance plans. The artist revealed that he will be continuing his Las Vegas residency next month. Even though the residency at Mandalay Bay was scheduled to wrap up next month, Santana will be extending his show, called his “Greatest Hits Live” show so that it goes into 2014. The 15 additional performances will take the show into February 1st of next year. Tickets to see the shows as part of the performer’s Las Vegas residency are on sale now. This week tickets officially went on sale for the 2013 World Series as the two teams for the massive baseball championships have finally been decided. This past Sunday night, the Boston Red Sox came up with a late game win against the Detroit Tigers in a win that helped them gain momentum to eventually beat the Tigers in Game 6 of the American League championships with a 5-2 victory on Saturday night. Although the Red Sox were trailing in the seventh inning they once again pulled out a victory to beat the Tigers and win the American League title, for their first appearance to the World Series in nine years. Meanwhile in the National League, the Saint Louis Cardinals, were taking on the LA Dodgers at home for a finals game to determine who would be heading to the World Series from the league. 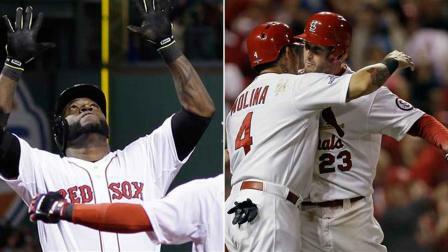 The Cardinals closed the series by beating the Dodgers in a 9-0 blowout in Game 6 of the NLCS championships. This put St. Louis in the top spot of their division and granted them a ticket to go to the 2013 World Series. Over the past ten years alone, the Cardinals have won two different World Series titles, and with their recent win over the Dodgers they are in place to bring home a third World Series to St. Louis. This week, there were several major music announcements that have had concert goers of all types reeling. One of the biggest announcements of the week came from the rock band Passion Pit. The indie rock outfit is slated to spend all of October and November on the road as they promote their latest record “Constant Conversations.” During this new tour event, the band will be visiting several major venues and also performing a special Halloween Show on October 31st in Fairfax, Virginia. During this outing the rockers will also be making an appearance at the Coastline Festival in Florida on November 9th and 10th. The band’s latest record just reached the top five on the Billboard 200 and during this new tour event, fans can expect to hear some of the biggest songs from this album performed live. Meanwhile singer and songwriter Chris Isaak will be heading out on a month long tour event of his own before the end of the year, promoting his 10th studio album “Beyond the Sun.” The tour will begin in Solana Beach, California on November 27th and will keep the singer on the road until December 22nd where he will wrap the tour up in St. Petersburg, Florida. Major stops include shows in Charlotte, NC, Boulder, CO and more. Tickets are on sale now and available for those who want to see Isaak perform live. This week the official Broadway revival of The Winslow Boy hit theaters to anxious fans who have been looking forward to this new stage rendition. The Roundabout Theatre Company has brought about this Broadway revival of a story that talks of family loyalty and love. The new production officially debuted on October 17th at the American Airlines Theatre. The production stars Tony Award winner Roger Rees and Academy Award nominee Mary Elizabeth Mastrantonio. The cast is filled with award winning actors who bring this classic tale that first appeared on the stage in 1946, to life. Those who are looking to see the story told once again on Broadway can get tickets to see the production now. Tickets are expected to sell fast so those who want to see all of the action unfold live are encouraged to act quickly when getting their tickets. There was another big announcement this week regarding a highly anticipated upcoming production. This Thursday, it was revealed that a new world premiere stage adaptation of An American In Paris will be hitting the Broadway stage in 2015. The production will be directed and choreographed by Christopher Wheeldon and will first premier at the Theatre du Chatelet in Paris in late 2014 before coming to the United States to make its official debut on Broadway. Tickets are expected to go on sale early next year with an expected opening date in Paris for December 2014 and an expected premier on Broadway for early spring of 2015. This week the official line up for the 8th annual Stagecoach Festival was revealed. According to the team behind the three-day country festival, the event’s official line up will include headlining performances from Luke Bryan, Jason Aldean and Eric Church. The festival will be taking place next spring, April 25th-27th at the Indio Empire Polo Club in Indio, California. These are not the only performers for the vent either. The announcement revealed that other acts such as Florida Georgia Line, Brantley Gilbert, Loretta Lynn, Hunter Hayes, Jennifer Nettles and John Prine will all also be performing at the event. Tickets go on sale this week on October 18th for those looking to see all of the action unfold live. However, one of the biggest announcements of the week came when the official lineup for the iHeartRadio holiday run was revealed. This year’s iHeartRadio ingle Ball tour will feature some of the biggest names in music and will include an extensive three week holiday tour that will keep the artists on the road throughout much of the holiday season. The current tour plans involve 12 city stops, starting on December 2nd in Dallas, Texas and wrapping up on December 20th in Miami, Florida. During the tour, fans can expect to hear short sets from the event’s artists and unique collaborations from the talent, for a concert experience designed to be unlike any other.